Latest News What’s In Store For Blockchain In 2017? Blockchain technology is the backbone of Bitcoin. But since its inception in 2009, the technology has grown to support many use cases and projects around the world. 2017 will be a big year for blockchain. In this blog post, we cover the top areas of the blockchain industry and what we can expect for blockchain in 2017. There are 7 Banks that want to go live with blockchain in 2017. A recent CoinDesk article reveals that 7 major European banks are partnering on a new blockchain-based trade finance platform called the Digital Trade Chain (DTC). They have a tentative plan to launch in Q3-Q4 of 2017. Those backing the platform’s development are looking to establish a secure place to manage open account trade transactions for both domestic and international commerce. DTC utilizes a permissioned ledger, with authorized parties allowed to submit transactions on the platform. Open account trade transactions involve products being shipped before the actual payment is due, meaning that trust among the transaction’s parties is imperative. With DTC, those plugged into the system will be able to track the progression of those transactions, from initiation to settlement. Thus far, the banks involved – KBC, Deutsche Bank, HSBC, Natixis, Rabobank, Société Générale and UniCredit – have signed a memorandum of understanding that lays out the basic groundwork for future development. That said, the banks are looking to launch DTC sometime in 2017, with an eye to building support in markets like France, Germany and the UK. A conference that caught our eye recently is the MIT Technology Review Conference: The Business of Blockchain. Blockchains have the power to create entirely new kinds of businesses and more people are starting to realize this everyday. Blockchain is still relatively new. The industry is still in its infancy. We can expect a variety of new use cases to be introduced in 2017. Bitcoin is the largest and most well know blockchain project. It is currently traded all around the world and more businesses are beginning to accept Bitcoin as a means of payment. Many people believe the public blockchain with the most attainable and impactful scalability roadmap is Ethereum. BlockApps is an enterprise-grade Ethereum-based blockchain infrastructure solution used in banking, payments, insurance, supply chain and others. BlockApps is designed to provide a permissioned Ethereum environment which easily operates at scale, allowing applications to handle a high volume of transactions per second. Developers can build interfaces with their permissioned blockchain using a REST API. On January 17th, 2017 Steemit.com was featured on Forbes.com. Author, Roger Aitken covered the 2017 comprehensive roadmap for Steemit.com. The big news surrounds the Steemit.com migration to Amazon Web Services, the world’s largest hosting provider. Steemit has racked up over 120,000 registered users in around 6 months and they need to be able to handle more traffic as the platform grows. Follow My Vote continues to pioneer end-to-end verifiable blockchain voting software in 2017. See our Github repo for updates on our software. In 2016, we managed to get featured on Forbes.com and successfully integrated our stake-weighted voting software with the BitShares blockchain. 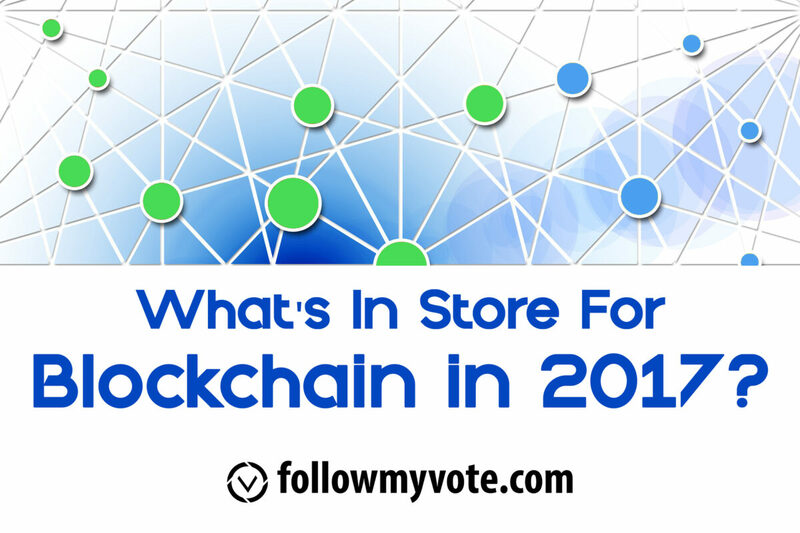 We anticipate that 2017 will be filled with many Follow My Vote software releases and partnerships, in an effort to bring end-to-end verifiable blockchain voting to the world. Learn about our 1 person 1 vote blockchain voting software.